Hunting with ACO is comparable to the "Piebald Elk" in many ways. We strive for rare adventure, to see the uncommon, to experience the moments in nature, that truly can only be captured by being there. "ACO", setting the standard into the backcountry. The "piebald" is a rare genetic color mutation that appears like partial albinism. Since ancient times, white animals held a special place in human society and are prominent and even sacred in many cultures. Animals with the piebald mutation lack pigmentation in certain parts of their bodies. A spotting pattern often occurs with the intermixing of pigmented and non-pigmented hair, skin, or feathers. Piebald animals often have very stunning and distinguishing patterns. The magnificent piebald elk pictured here was taken by Katy Weaver on a muzzleloader hunt in Arizona in October of 2016. She was guided by her brother, Toby Weaver, owner and operator of Antler Canyon Outfitters. This elk is of world class size. If official records were kept for color mutated animals, could very well be aWorld Record. The piebald trait in elk occurs in about 1 out of every 100,000 animals. The Rocky Mountain Elk is so uniquely beautiful and majestic in and of itself but the piebald is particularly breathtaking. Truly a class of its own. 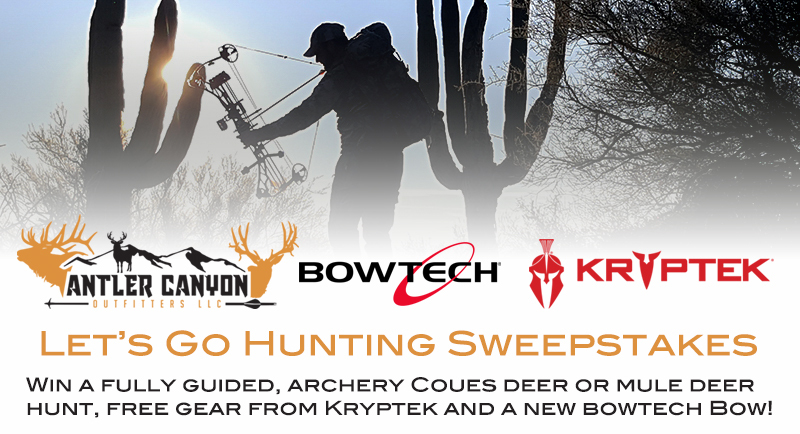 Win A Guided Arizona Deer Hunt, Kryptek Camo, and a bow from Bowtech! JOIN THE ANTLER CANYON EMAIL LIST! Like hunting, shed hunting, special draw information? Simply sign-up and we'll keep you posted on it all!